I have recently purchased a second hand Yamaha B2 Silent Piano and I would like to say the I found the whole process was very enjoyable. Nothing was a problem to the Dominic who was cheerful and very helpful. I was part exchanging a digital piano and taking out interest free credit for the purchase. Nothing was a problem and all was arranged in no time, without a hiccup. The delivery was prompt and again the staff were friendly and nothing was too much of a problem. 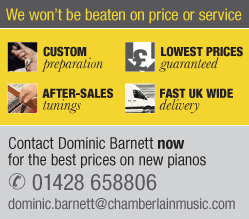 The piano itself is just great even though it is second hand; the servicing and polishing etc by Chamberlain Music is second to none. I'm just awaiting the first tuning of the piano which was included in the price. I'm sure the service will be exceptional. I'm very happy with the whole experience and Chamberlain Music will be my first port of call for any future musical developments. Call us today on 01428 647593 for the lowest UK price! We won't be beaten on price or service! The Yamaha B2E is a wonderful upgrade from the Yamaha B1. At 113cm high, 53cm deep and 149cm wide the soundboard is that bit larger than its smaller cousin making it noticeably more resonant, and its traditional styled legs make it much more traditional looking. The piano is fitted with castors making it much easier to move. It is available in polished black, mahogany and white as well as satin walnut, cherry and beech wood finishes. The B2 has a remarkably responsive action, more so than the smaller B1, making it perfect for the beginner or more experienced player alike. Featuring a solid spruce soundboard the overall resonance of the piano is also much improved. Despite the solid soundboard Yamaha have managed to keep the instrument extremely well priced so the overall package makes for excellent value too! We always keep the B2E in our showroom alongside the B1 and larger B3E. Click here to ask for a brochure or any further information.